The very high quality of products from mbk is the result of many years of know-how, optimised transfer of knowledge, continuing innovative force and a reliable entrepreneurial intuition for the solutions of tomorrow’s market. Since the company was founded in 1961, mbk has been developing and selling welding machines and plants for the concrete industry and impressing all over the world through the high level of individualisation. With more than 900 welding machines sold and over 1,100 machines in total in more than 60 countries, as well as pronounced customer orientation, mbk has established itself as one of the leading companies in the industry. mbk began in 1990 to expand its activities to the Latin-American market. mbk has long since made a name for itself in Latin America and has sold 40 machines there to date. A BSM-300-R has now been delivered to the customer “Fábrica de Tubos Campeón” in Costa Rica. 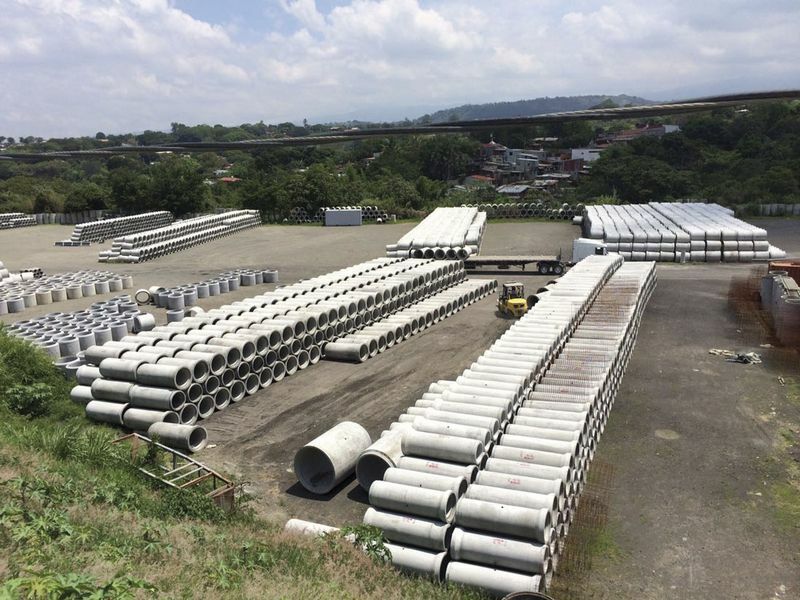 “Fábrica de Tubos Campeón”, based in Alajuela, a city in the Central American country of Costa Rica, is an important manufacturer of concrete pipes that conform to the international standard ASTM C-76 y C-14 and INTE. Founded in 1955 by Isauro Castro Cruz as “Fábrica de Pilas Campeón” (Pilas = basin), the small production facility initially manufactured mobile concrete basins for washing clothes, mosaics and fence posts. In May 1989, the sons Luis Alberto Castro López, Marvin Castro López and Alfredo Castro López followed in their father’s footsteps and expanded the company to the present day “Fábrica des Tubos Campeón” (Tubos = pipes), which, as the name suggests, concentrates on the manufacture of concrete pipes. Quality, progress, new technologies and a high level of customer orientation are the values that characterise the day-to-day business of Tubos Campeón. These aspects made a decisive contribution to the reviewing and changing of this company’s business. In 1998 the owners’ vision became reality when the production was automated. By this investment in top technology an increase in throughput and an optimisation of quality was achieved, from which the customers benefit lastingly. The markets are constantly changing in Latin America too, forcing companies to adapt themselves to the changing needs. The agile owners of Tubos Campeón have always recognised the signs of the times with a reliable entrepreneurial farsightedness and have now extended the vertical range of manufacturing accordingly. To this end a reinforcement welding machine of the type BSM-300-R from mbk was acquired. 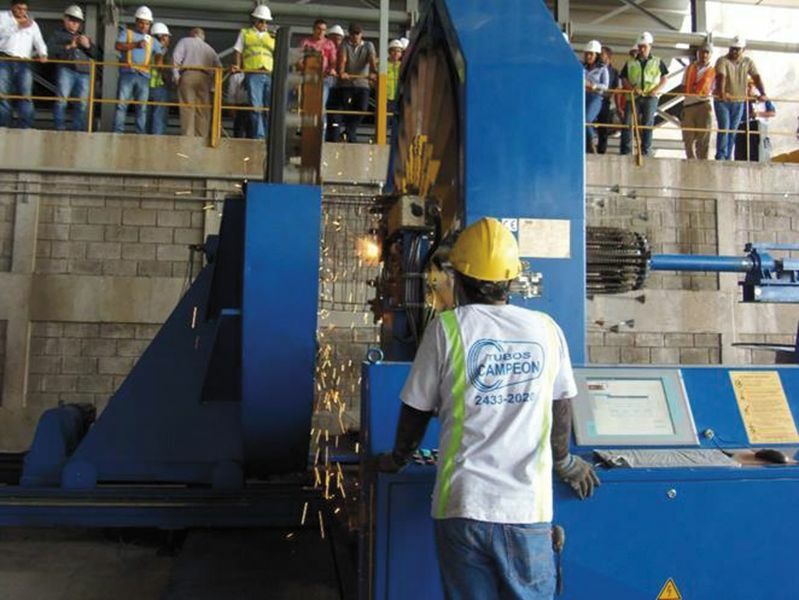 The BSM is a welding machine for the production of steel reinforcement cages for the concrete pipe industry, designed for high production outputs. 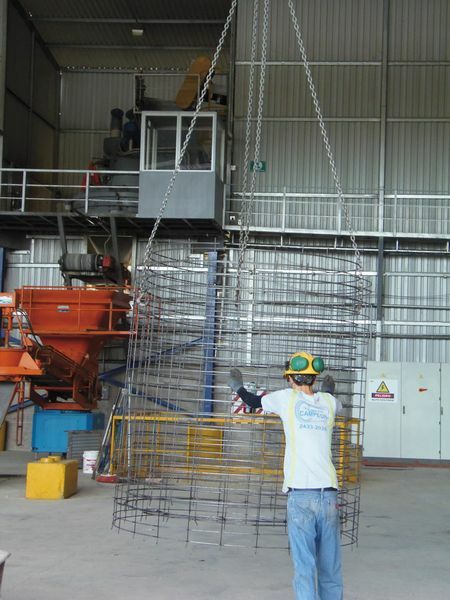 It can be used to manufacture reinforcement cages with diameters of 330 mm to 3,000 mm and a length of up to 3,500 mm; the number of longitudinal wires is 24. Apart from its stable design, the BSM-300-R is distinguished by its extreme reliability, high productivity and flexibility – like all other machines from mbk, too. Closest possible production tolerances guarantee precise and straight cages; compatibility with every standard is assured. The very low maintenance and energy costs, the high user friendliness and the minimum use of manpower make them very suitable for day-to-day operations in which economic aspects have to be fulfilled. An enormous range of accessories is available for mbk welding machines, with which optional equipment or retrofitting is no problem. By the addition of automatic wire feeding and cage removal the BSM can be upgraded to a fully automated machine – it is possible to automate the machine at any time later on. 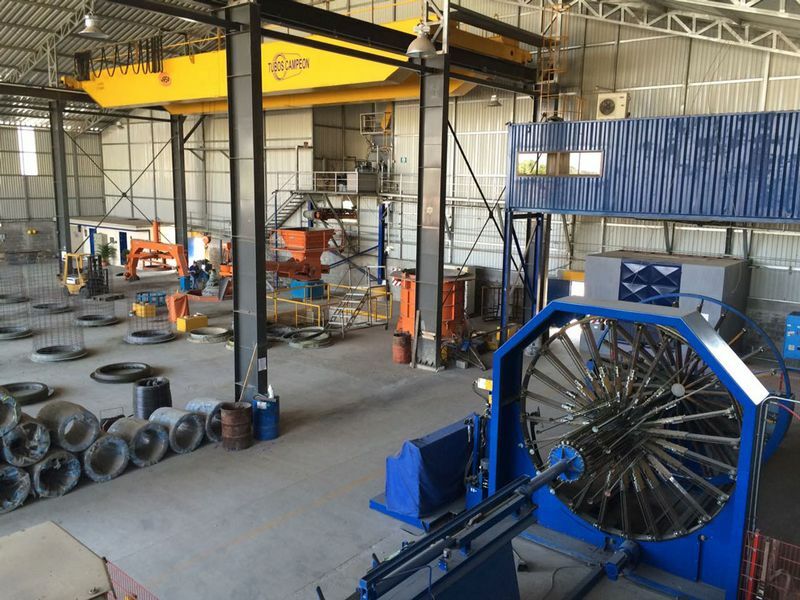 Numerous engineers, architects, suppliers and customers took part in the opening celebrations for Tubos Campeón’s new plant. They were all able to see for themselves the efficiency of the new mbk welding machine under very real day-to-day production conditions. 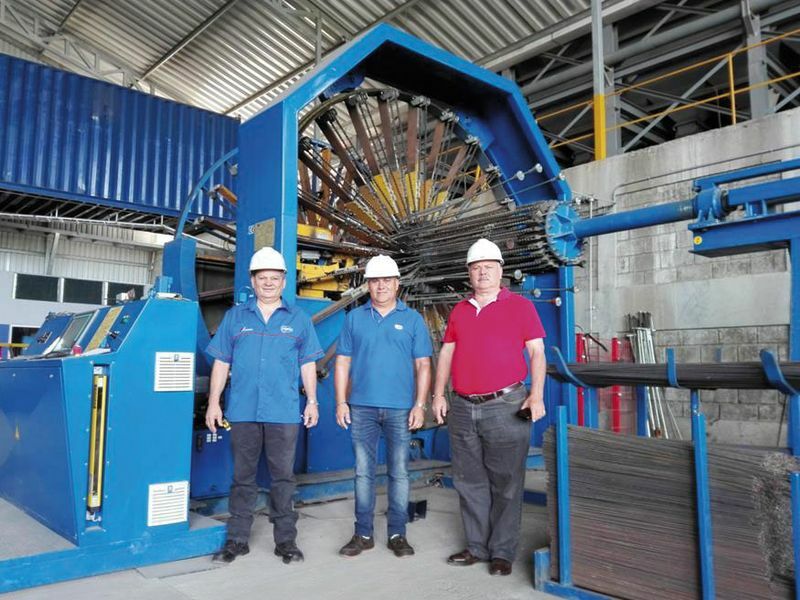 With the new cage welding machine, Tubos Campeón is currently capable of manufacturing around 200 pipes per day in the most diverse sizes. The newly gained capacities will now be used to pro cess incoming customer enquiries even more promptly and to complete orders even faster. Tubos Campeón is a good example of how much the optimisation of technical processes can influence a company: work is noticeably facilitated, turnover increased and new quality benchmarks set. The expansion of the range of services is an asset both for Tubos Campeón and for its customers. The concrete pipes from Tubos Campeón are regarded as top products and can be procured with diameters ranging from 300 mm up to 2,440 mm. This has made the company one of the most important concrete pipe suppliers in Costa Rica. Its large customers include state authorities, municipalities, building contractors, etc. Tubos Campeón is not content to rest on its laurels, however, and already has a new vision: the development and realisation of embankment sections, pipe elbows, water channels, etc. is planned for the near future. And then there are further goals to be reached. Because it’s about moving forwards. Keeping in motion. Opening up new markets without losing sight of healthy growth in the process. Success needs courage, know-how and empathy. And a great sense of responsibility. These are all strengths of Tubos Campeón and mbk.